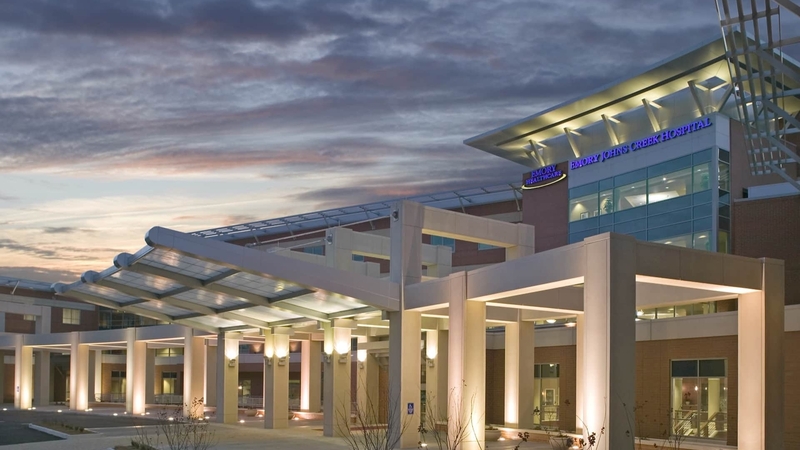 Emory Johns Creek challenged TMP to design a hospital with a “five-star hotel” experience with the ability to deliver efficient and advanced medical care. Additionally, the hospital needed to accommodate the possibility of future expansion of its medical campus. TMP’s design recognizes the need for sustainable growth solutions, as steps were taken to ensure the building harmonizes with the surrounding natural topography, delicate wetlands and wooded hillsides. A freestanding colonnade, which creates a grand processional entrance and provides exterior circulation between the hospital and medical office building. The hospital lobby features a three-story atrium and large glass openings, filling the space with natural light. It functions as a place for gathering and respite for visitors and staff. A concierge desk replaces the information desk. The lobbies of the medical office building and hospital are connected to create a consolidated, expansive circulation space, providing a seamless transition between the two facilities for both patients and physicians.